Led by award-winning Executive Chef, Jacques Qualin, J&G Steakhouse at The Phoenician is serving up Spring by the plateful with its annual 3-course Easter Dinner Menu for $55++ per person. Offered on Sunday, April 21 from 5 – 10 pm, J&G’s Chef Qualin has dug deep in his recipe book, and secured the freshest seasonal ingredients, to craft spectacularly flavorful dishes such as Sweet Pea Soup topped with creamy Parmesan Foam, or Dungeness Crab Salad accented with asparagus ribbon, spicy mustard, and bright, bold melon juice. Even traditional Easter dishes such as Roasted Lamb Lion are reinvented thanks to Chef Qualin’s herbal-yet-hearty basil gnocchi gratin, plus delicate Spring onion and savory sweet pepper juices. Finally, J&G’s Easter Menu also offers multiple (and delicious) Gluten Free and Vegetarian options for diners looking for full flavor with a restricted diet. Best of all, J&G is also serving up its full regular dinner menu of award-winning steaks, seafood and more, alongside the 3-Course Easter Menu. Reservations are highly recommended: 480-214-8000 or www.jgsteakhousescottsdale.com. 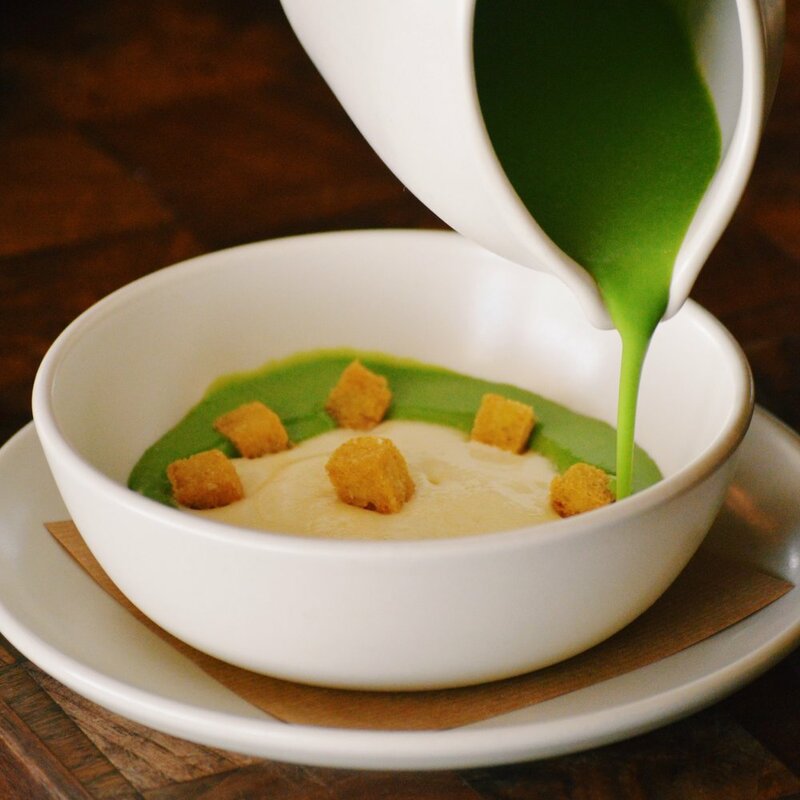 Even tastier, Chef Qualin has revealed his recipe for Sweet Pea Soup. Instructions are below, or you can swing by J&G this Easter and let J&G handle all the shopping, cooking and dish cleaning instead. In a Rondeau combine oil, onions, garlic and salt and sweat covered until totally soft. Add the water and bring to a boil. Let boil for one minute, then cool over ice until very cold. Combine all in a pot and bring to a simmer. Remove from heat, and then steep for 15 minutes. Remove thyme and squeeze well, then puree cream in a blender until smooth. Strain through a fine mesh chinois, season with salt and load into whipping gun with 2 N2O cartridges. If cold, warm until just above body temperature before loading. Must be served warm. Cut bread into half-inch dice and sautéed in olive oil, then season immediately with salt.